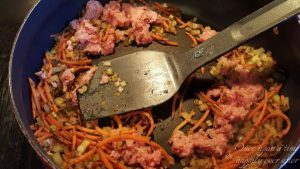 Hurrying to get this recipe post written for my Crock Pot Cheeseburger Soup so you can make some in time for dinner tonight. Almost as easy to make as it is to pull up to the McDonald’s drive-through window. Grab your crock pot. I’ll meet you in the kitchen. There is nothing…NOTHING…PC likes better than a cheeseburger. Really. Nothing. After baseball games on Saturday, he almost always indulges in either a #1 at McD’s or a Wendy’s double cheeseburger, small fry and a Frosty. Not sure on that number as Wendy’s just opened out here near us. Most of the time, I can take them or leave them but eating fast food beats cooking in my book. 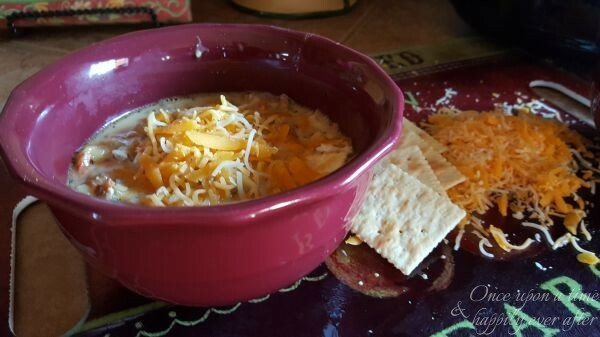 Except when I have an easy recipe like this one for Crock Pot Cheeseburger Soup. You’ve got your crock pot, now grab these ingredients. As is per usual when I cook, my recipe is a combination of a couple of recipes I found online. 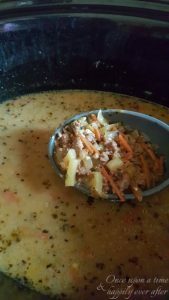 This time I combined Skinny Slow Cooker Cheeseburger Soup with Life In The Lofthouse Crock Pot Cheeseburger Soup. So mine is Leslie’s Skinny Lofthouse (whatever that is) Crock Pot Cheeseburger Soup. You can find both of the original recipes here, on my Souper Chili and Stews Pinterest board. Disregard the number on my scale. 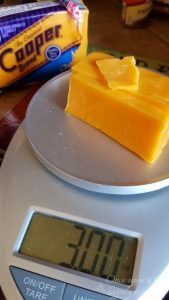 I was using full fat cheese because I was lazy and didn’t want to run to the store to get the low fat version. So I used less. Which made my Crock Pot Cheeseburger Soup more like a Crock Pot Hamburger Soup. 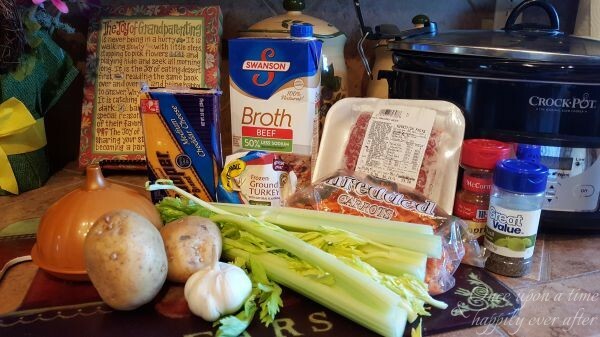 Do you have a cheeseburger soup recipe you can share? I am sure PC would encourage me trying any and all versions. We are still on what he calls ‘soup diet’ so please share your favorite cheeseburger or any kind of soup recipe in a comment below. If you try this recipe, please let me know. PC really liked it and for a few days, we skipped McD’s. Apparently, cheeseburgers are part of the soup diet. Ok, all this talk about cheeseburgers and soup is making me hungry. And I haven’t accomplished nary a thing today so I have a lot to do before PC gets home. 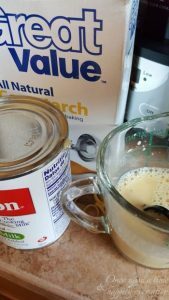 Be sure to run by The Blended Blog for today’s “Tasty Tuesday” post and link-up. And thank you for spending a bit of your day with me! Yum. I make a hamburger soup that’s similar, but this looks delicious. I will have to give it a try. 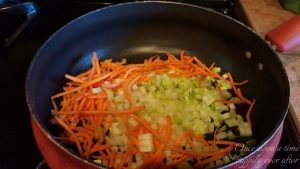 My soups usually turn into a stew because they are slow thick. Haha. Brett always has to add more liquid and gives me a hard time. I like my soups stew-like! PC adds crackers to every kind of soup so they all wind up souper, I mean super thick! I bet your hamburg soup is good. Looks and sounds delicious! My hubby would love this! Thank you. It is kind of a ‘man’ soup. PC requests it now and then. 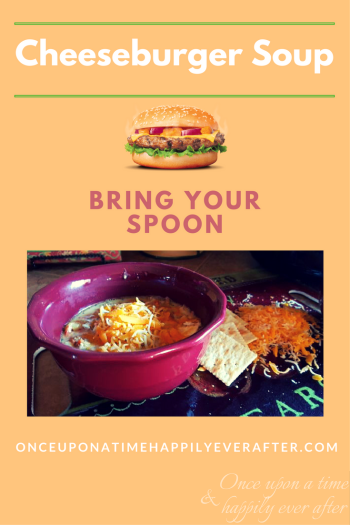 I have never made a cheeseburger soup! I need to try this, I’m always looking for new recipes to try. We have a kitchen scale, too, thanks to Brian! I’ve never used it, but maybe now I will! ha! Ha! I have to blow the dust off my scale. When I use it and keep really good track of my WW points, I actually feel better, look better and lose weight. But all of that is such a pain. And being chubby is so easy!! !